Epigenetics is a rapidly expanding research field that explores heritable alterations in cells and organisms not controlled by their DNA sequence. Epigenetic research is highly relevant to human health as well as agriculture and climate change. 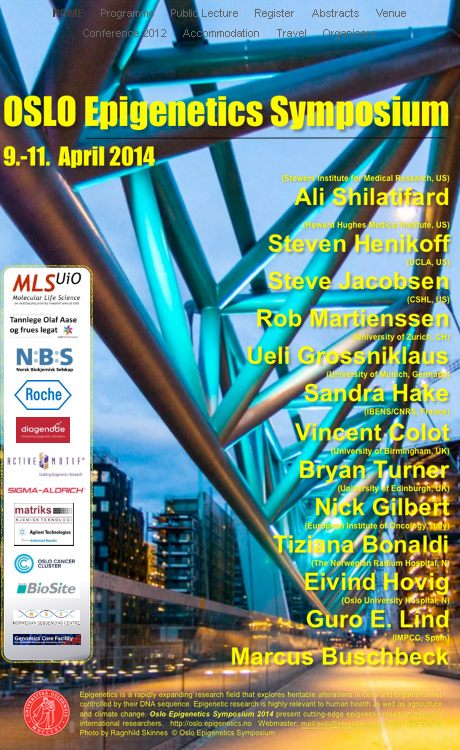 Oslo Epigenetics Symposium 2014 held in Oslo 9.-11. April present cutting-edge epigenetic research from top international researchers. Registration is still open. The public lecture 9th of April "Epigenetic inheritance- what is the impact ?" is by Dag E. Undlien from OUS and is free upon registration.